Easter lands on Sunday, April 21st so there are just a couple weeks to get ready with decorations that celebrate this glorious spring holiday. 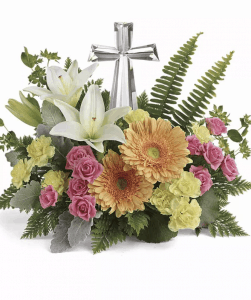 This spiritually inspired Easter centerpiece features orange gerberas, pink roses, and white lilies along with a keepsake crystal cross. A fishbowl vase holds a bright mix of spring flowers and greenery. It’s ideal for your Easter buffet table or as a welcome to visitors. 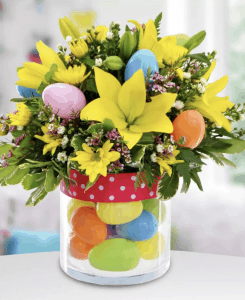 This fun Easter arrangement includes a glass vase filled with colorful plastic Easter eggs that are topped with spring flowers and greenery. This spring centerpiece full of seasonal blooms and greenery will brighten your Easter table. This Easter flower arrangement combines a mix of yellow and purple flowers for a regal look to your Easter event. This spring bouquet created has a mix of bright and pastel flowers in shades of purple, pink, and green. This formal Easter flower arrangement offers grace and elegance with a mix of premium flowers and greenery as well as a candle accent. 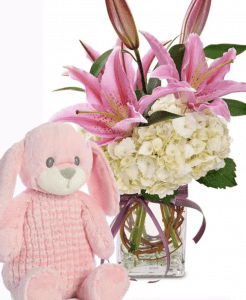 Fresh hydrangea and lilies are arranged in a bouquet with a plush bunny in this thoughtful Easter gift package. Our Sweets and Treats Gourmet Box is filled with all types of sweets and chocolates. It’s a great gift idea when looking for something to bring to an Easter event. Come place your Easter order in our Memphis flower shop or use our convenient online ordering process!